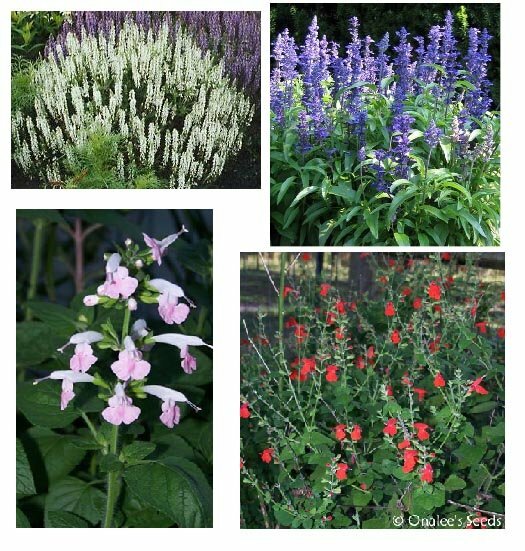 Salvia / Sage Seeds Collection: Blue, White, Pink and Red. 4 packs/price of 3! Four Packs of sage/salvia seeds for the price of 3! Get 24+ Seeds each of: Red Texas Sage, Pink Texas Sage, Victoria Blue Salvia and Victoria White Salvia - all in separate packs (not mixed)! Don't let the delicate looking flowers fool you - these are TOUGH plants! These all prefer full sun and fairly dry conditions - perfect for that spot in your garden that is hot and dry - super easy to care for! They definately don't like wet feet, but they will bloom from mid-summer to frost for you growing in dry, poor soil and full boiling sun! They really make an impact planted in groups! For purposes of qualifying for the free bonus pack of seeds, a COLLECTION counts as ONE ITEM.